This is a 1960s Soviet-made postcard. It features two anthropomorphic bears, an anthropomorphic rabbit, some birds and an evergreen branch. "During the Soviet years, Christmas celebrations were not allowed in Russia and the Soviet Union. New Year's celebrations that were similar to Christmas celebrations elsewhere began in the 1930s. Ded Moroz (Grandfather Frost) took the place of Santa Claus at children's parties. He was given a grandaughter, called Snegurochka (Snow Girl or Snow Maiden), to help him. At first the New Year holiday was for children, but later it became a holiday for everyone. 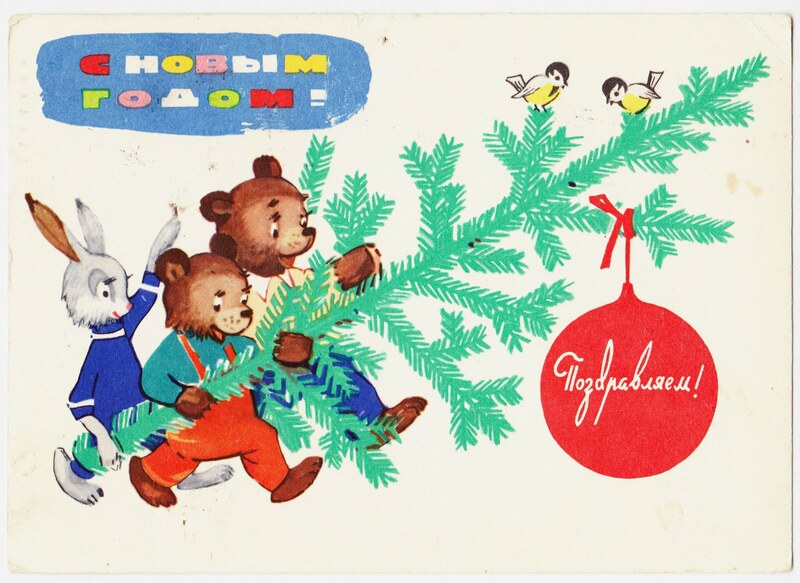 ... A real revival of Russian greeting postcards occurred in the 1960s. Although the artwork became more modern and international in style, the themes often show typical aspects of the Soviet and Russian culture. Many of the designs also show a decorative folk art influence." Поздравляем kind of means "we whish you all the best". I have a different question: what role does the rabbit play in stories about Ded Moroz? In Russia, you can buy chocolate rabbits for New Year's, that are sold in Europe for Easter. The two phrases go together: поздравляем с новым годом! поздравлять мeans "congratulate".